After the People’s Climate March in 2014, we applauded the response by the Mayor and City Council to set goals of reducing greenhouse gas emissions by 80% by 2050, achieving zero waste to landfills by 2030, and installing 100 megawatts of renewable energy on public buildings by 2025. But we know that bold climate goals must be implemented in conjunction with equally ambitious equity goals in mind. 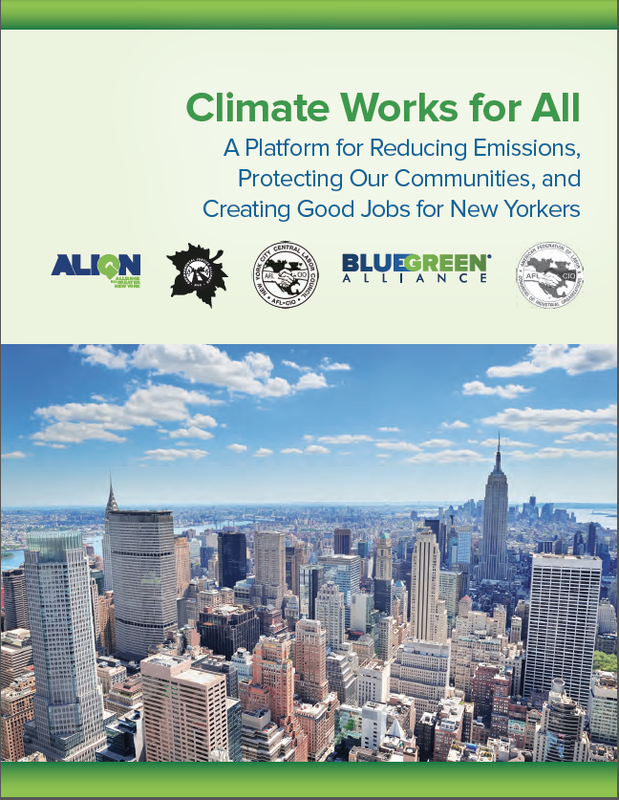 Soon after the People’s Climate March, the newly formed Climate Works for All coalition of community groups, environmental justice organizations, labor unions and other allied advocates released its first report, Climate Works for All: A Platform for Reducing Emissions, Protecting Our Communities, and Creating Good Jobs for New Yorkers, that details ten proposals to make our city more resilient, create nearly 40,000 good jobs each year, and cut our annual greenhouse gas emissions by nearly 12 million metric tons of carbon equivalent. Establish stronger labor standards for good jobs, safe worksites, and local hiring programs targeted toward low-income communities, communities of color, and women to give them the opportunity to become an important part of our city’s climate workforce. Install more solar in environmental justice and low income communities. Re-invest utility savings derived from the transition to renewable energy back into communities impacted by environmental pollution, public disinvestment, and climate change. In May 2017, the Climate Works for All coalition launched the report “Restart Solar – Energizing Environmental Justice Communities” at a community event hosted by El Puente in Brooklyn. “New York City has taken the first steps towards a clean energy future by setting a goal of installing 100 megawatts (MW) of solar power on public buildings by 2025. Alongside expected private sector solar installations, this will help reduce our City’s carbon emissions and our dependence on fossil fuels.